Although modern scholars no longer accept the traditional explanation of the history of the I Ching, I will include it here, as most modern interpretations include this version, even though it’s based on myth and legend rather than hard evidence, which in any case is in very short supply. 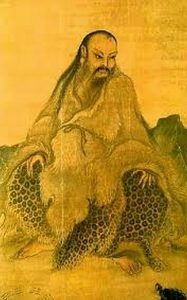 Legend has it, that over five thousand years ago (c. 2900 BCE), before the introduction of writing, there lived a Chinese sage, or wise man, named Fu Xi (aka Fu Hsi). He is credited with being the first man to unite the warring states of the region. A brilliant scholar, he surveyed the workings of the Universe and of all human behaviour. He developed a mathematical model to describe the human condition. He found that everything in the Universe went through cycles, including our lives, and that during our lives, we went through many cycles. He compared these life cycles with the seasons: Spring – a time of growth: Summer – a time of fullness: Autumn – a time of slowing: Winter – a time of rest and recuperation, ready for the next Spring, and so the cycle repeats. He believed that it was possible to identify where we were in a particular cycle so that we could adjust our behaviours accordingly. For example, if in a particular cycle, our life situation was passing through the Autumn phase, then it would be counter-productive to attempt to promote growth in our endeavours. The correct behaviour would be to wait until the Spring part of the cycle and then go for it. The I Ching knows where we are in a particular cycle and advises us accordingly. In the time of Fu XI, writing had not been developed, so the teachings were handed down orally, often in the form of poems, and frequently couched in florid language, in order that the teachings could be passed down the generations with as little distortion as possible. About three thousand five hundred years ago, (c. 1500 BCE), writing began in China and the teachings were inscribed on ‘oracle bones’, many of which still exist today in museums. In about 1200 BCE there was a brilliant scholar called Wen, whose son, King Wu, overthrew the ruling corrupt emperor of the Shang dynasty and established the Zhou dynasty, which lasted almost 800 years. 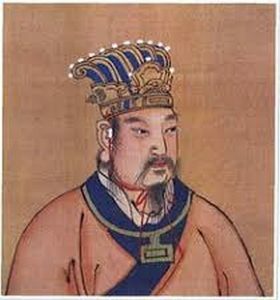 King Wu honoured his father with the title of King, who, although he had never ruled, was thereafter known as King Wen. King Wen is credited with pairing the eight trigrams in all possible combinations to produce the sixty-four hexagrams. He named the hexagrams and appended short pithy Judgements, and his fourth son, the Duke of Zhou, interpreted the meanings of all the lines of the sixty-four hexagrams. By about 1100 BCE the I Ching was considered complete and has been handed down to us in more or less its original form. Over the millennia, many scholars have added comments and interpretations, perhaps the most significant being around 500 BC, when Confucius (551-479 BCE) is said to have written many commentaries which add to our present understanding of the text. A later edition was produced around 1700 AD when the best commentaries of that period were added. That edition was translated from the original Chinese into German in the early part of the 20th century by Richard Wilhelm, a missionary based in China. In order to reach a wider audience, it was rendered into English by Cary Baynes under the supervision of Richard Wilhelm, and after RW’s death, by his son Hellmut Wilhelm, who has also written two important works about the I Ching. The English edition was first published in two volumes hardback in Great Britain in 1951 by Routledge & Kegan Paul, and the work is currently published in its third edition in paperback by Penguin Arkana. However, as this and other full versions of the work have been translated more or less faithfully from the original Chinese, newcomers to the text will find difficulty in following the arcane language and obscure references. For this reason, they would be advised to start with an introductory text, such as this, which has been interpreted more in keeping with the modern world.